Frogger was a product of the popularization of "cute" games throughout 1981 that moved away from alien and explosion themes. In the game, you must direct a frog through traffic, and across a crowded river, and in to one of five enclosures at the top of the screen. 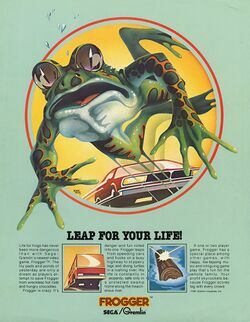 Frogger isn't credited with many innovations, but it did break ground in continuous background music that changed contextually based on the action in the game. In 1982, Parker Brothers was determined to become a major player in the video game industry. As such, they joined the race with Atari, and later Coleco, to acquire the home conversion rights to several popular arcade hits. Along with Q*Bert and Popeye, they scored the rights to release Q*Bert for home systems and computers. In an ironic twist, they only acquired the rights to publish cartridges, and as such, Sierra Entertainment bought the rights to publish the game on cassette and diskette, providing some systems with two official conversions of the game. Since then, the Frogger license has been brought back like many classic gaming icons. Updated versions have appeared on the Game Boy Advance, PlayStation, Sega Dreamcast and Windows called Frogger: He's Back! released in 1997. This newer version is produced in 3-D and involve many puzzle solving elements. Frogger must return to his lily pad home in the swamp, and it's your job to guide him and direct across five lanes of traffic, and over the turtles and logs of the river, to reach his destination. This page was last edited on 11 February 2016, at 01:01.